After 25 full days of eating 100% local, it only now just hit me. Tonight I realized how profoundly hard this really is. I have been fueled by adrenaline, excitement, curiosity and just plain stubbornness for over three weeks which is dually reflected right back to me in Gowan’s fierce smile. But, tonight the veil slipped a bit. I joined a friend for a glass of local wine at Ukiah’s sassy new pizzeria, Saucy. And, although the menu features an impressive amount of local fare on the plate and on tap, I couldn’t partake in the almost completely local crab cakes, or the kale salad, or anything at all aside from a glass of Philips Hill Pinot. The chalkboard menu overhead proudly stated the names of the brewmasters behind the beer and the names of farms & fisheries which the food came from. My friend Cynthia, Saucy’s inspired owner, is doing a fantastic job of bringing local food and great pizza to the people. But, I couldn’t eat any of it. I knew better than to arrive hungry, so I had a pre-happy hour snack beforehand. But, being out in the dining world and discussing this project with mainstream eaters put things in perspective. For most people, what you consume is calculated by convenience, time, price, proximity, dietary restrictions or allergies, tastes/preferences, religious beliefs or values, and a number of social factors. Or just feeling lazy and not wanting to do the dishes. This experiment is the ultimate trump card. I have been “difficult” to feed for years due to many of the previously listed reasons, and I am used to reading every ingredient on the label, picking apart menus and traveling with snacks. This project brings everything to an unprecedented new level. Our lives have to completely revolve around food, and the decision about what to eat comes down to what’s available, calories and survival. It’s intense. It’s also really wonderful, beautiful and revealing. When I look back on my week, I tracked some serious kitchen hours: made three batches of yogurt, two batches of beef bone broth, attempted lemon curd, nearly cut my thumb off in a kitchen accident, increased the weekly butter order, secured six dozen duck eggs and 50 pounds of potatoes, hunted down local food at three different grocery stores in three different towns, traveled to two farmers markets, and prepared at least three meals a day from scratch. Oh, and all the dishes (which were hard to tackle with my right thumb bandaged and out of commission). All of this doesn’t leave a lot of time or patience to deal with things gone wrong, such as a malfunctioning washing machine and a car window that won’t roll up – which both happened this week. You still have to do all of that other stuff, plus schlep your laundry to the laundromat with a window taped up with Gorilla Tape. When I got home tonight, I was flooded with exhaustion and didn’t even know how I was going to muster the energy to feed myself. I found Gowan online and told her about the evening’s revelation. She agreed, “It’s the hardest. And it’s the best.” I am surprised that I hadn’t consciously realized this, yet. When anyone asks how it’s going, I have always honestly said, “It’s kind of chaotic, but it’s going really well.” There is also more to the story. It is perhaps the biggest logistical challenge I have ever undertaken. I have been too stubborn and too optimistic to allow that realization to fully register. Now that it has, nothing changes. We are bull-headed enough to charge forward through the leanest months of the year, and awesome enough to pull it off. What does this have to do with pie? I didn’t know, until tonight. 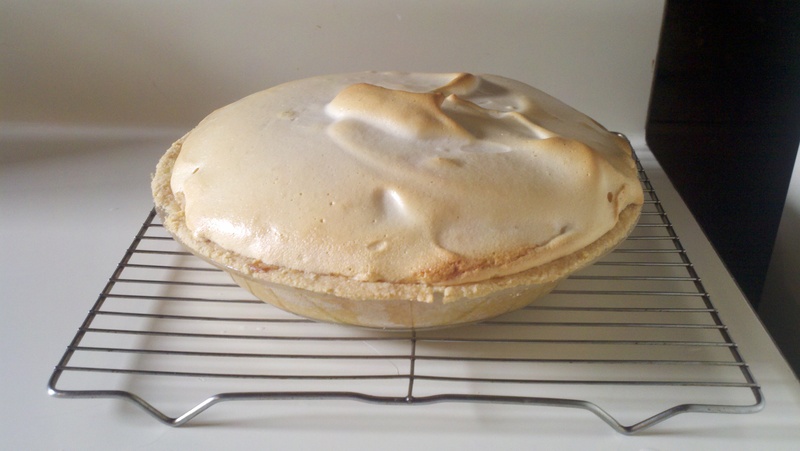 Since last week, I have been obsessed with making lemon meringue pie. I like pie, but I like a lot of other things more. 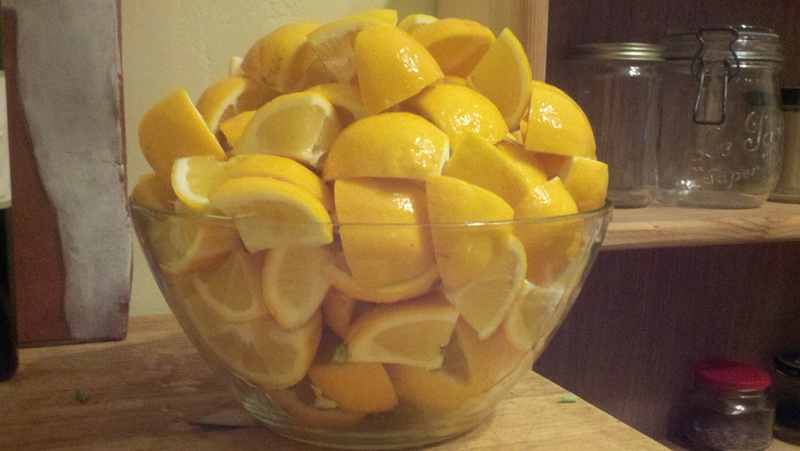 The idea was originally inspired by a box of gorgeous meyer lemons from my dad’s tree and I soon became fixated on making it happen. I set out to source all the other necessary ingredients which included fresh-milled flour from the Mendocino Grain Project, duck eggs from Potter Valley, butter from Boonville, wildflower honey from Lovers Lane Farm in Ukiah, and salt from the sea. I also enlisted the help of my baker friends to figure out how to thicken the filling without your standard thickening agent. Also, I know nothing about real pie crust since I’ve been gluten-free for over four years. My piemaster friend Simon did the real work, but I put in some serious time on the hand-powered egg beater to whip those egg whites to soft peaks. (See full phodocumentation on our Facebook page.) The whole undertaking was a lesson and an experiment in the art of pie – and a successful one at that! But, I realize now that it was about something else. Pie is much more than it’s aggregate parts, though its parts are noteworthy. Lemon meringue is exceptional for containing three distinct textures, all in one bite. The pie was a brilliant burst of yellow against the starkness of winter. But, ultimately pie is more about feeding the soul. When you have enough butter, eggs and fresh lemon juice and time to make lemon meringue, it is a sign that there is enough in the world. You are not just surviving; you are feasting on the abundance of life. Which is exactly what we’re doing, every day – but, sometimes you have to be licking the bottom of the pie pan to recognize it. Categories: Musings, Uncategorized | Tags: lemon meringue pie, lemons, locavore, mendocino | Permalink.